No need for introduction. 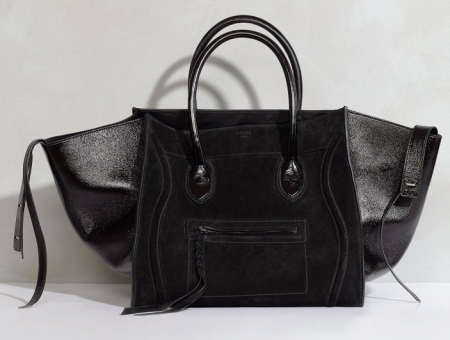 By now, we are all too familiar with the Celine Luggage tote. This one is however the 2nd generation: the Phantom Luggage with some adjustments to the original version. The faux croc stamped leather would be divine, but I decided to put my name down for the all black suede with patent leather sides, which is due to arrive sometime in july. Can't wait to hold it in my hands...let's hope that nobody on the list before me wants it...I know, fat chance!